Rock Springs Police Chief, Dwane Pacheco presents Bruce Pivic of Infinity Power and Controls with a souvenir shirt to thank Bruce for his donation and support of the Special Olympics. Rock Springs Police Chief, Dwane Pacheco participated in the 2019 Abu Dhabi, United Arab Emirates Law Enforcement Final Torch Run for Special Olympics in March. Chief Pacheco is thanking his donors and wants them to know how much he appreciated their donation. Pacheco was a part of a ten-person team with individuals from all over the country and world. Chief Pacheco was the top fundraiser on his team and because of that, he was able to choose a few items to present to some of his donors. 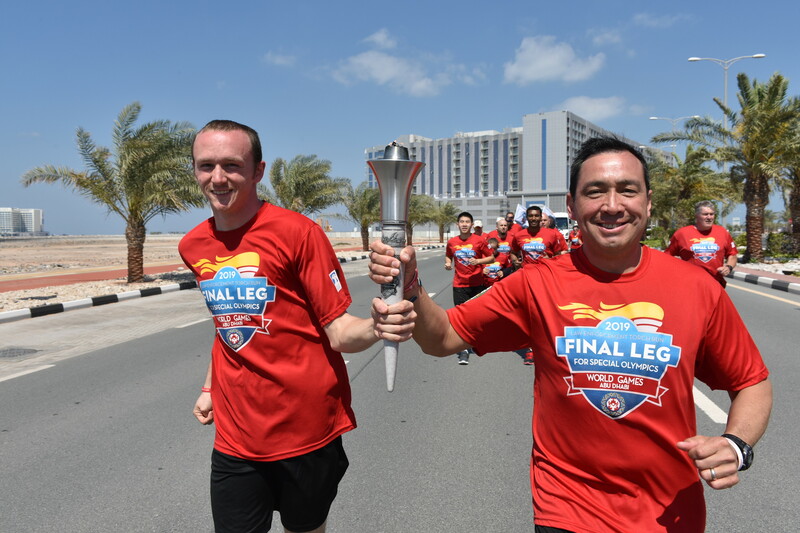 The Final Torch Run is modeled after the Olympics with over 109 countries participating. Since 1981, $733 million has been raised and the goal by 2021 is to raise one billion. Half the money he earned went back to the Wyoming Special Olympics while the other half went to ten Special Olympians so they could participate in the world games. Just a reminder, the Law Enforcement Torch Run for Special Olympics Wyoming is taking place on Friday, May 3 starting at 10:00 AM at Walnut Elementary. Law enforcement will run the torch to the Civic Center. All proceeds will benefit the Wyoming Special Olympics. Brenden Burke running with Chief Pacheco. Burke raised over $30,000 for the Special Olympics.